In the original edition (1979) of her standard book on contemporary Paganism in the United States, “Drawing Down the Moon”, Margot Adler wrote: “In the last ten years, alongside the often noted resurgence of ‘occult’ and ‘magical’ groups, a diverse and decentralized religious movement has sprung up that remains comparatively unnoticed, and when recognized, is generally misunderstood.” Those were people describing themselves as Pagans or Neo-Pagans. “The modern Pagan resurgence includes the new feminist goddess-worshipping groups, certain new religions based on the visions of science-fiction writers, attempts to revive ancient European religions – Norse, Greek, Roman – and the surviving tribal religions”, wrote Adler. In the meantime, Paganism has certainly not decreased and its expressions have become still much more varied than they used to be. There are now many academic books and articles on contemporary Paganism, especially in North America. Moreover, Paganism has grown into a more international phenomenon. But people active in Pagan ways still feel they are misunderstood in many places. However, at least in the United States, Paganism has now its place among other religious paths in a number of local, regional, and national interreligious initiatives, for instance. In order to learn more about Paganism today, Religioscope has met with Selena Fox, who has been active for many years in this field as the leader of Circle. Born in 1949 in Arlington, Virginia, Rev. Selena Fox is senior minister and high priestess of Circle Sanctuary, a Shamanic Wiccan church, Pagan resource center, and Nature preserve with a worldwide Ecospirituality ministry that includes networking, publishing, education, environmental preservation, counseling, events sponsoring, and other work. For more than thirty years, Rev. Fox has served as one of the elders, religious freedom activists, and public media spokespersons for the Wiccan religion and related forms of contemporary Paganism and Ecospirituality, nationwide and internationally. Being involved in networks across Pagan traditions, Selena Fox is certainly one of the most qualified Pagan leaders for helping us to gain a better understanding of this religious phenomenon. In this interview, she also tells us how she came herself to follow the old Gods. The interview took place in July 2004 at the Parliament of the World’s Religions, in Barcelona, Spain, and was revised by Selena Fox in August 2005. 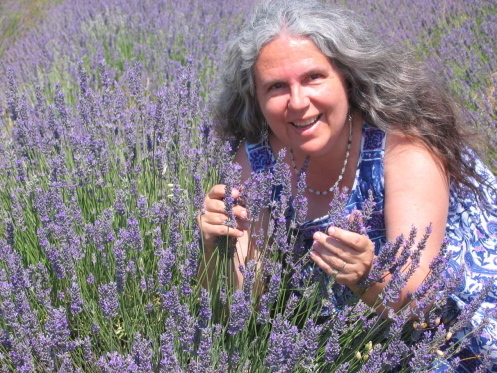 Photo of Selena Fox in a lavender field in the Provence in Southern France, taken by Dennis Carpenter in July 2004. Copyright Dennis Carpenter. Religioscope – How did you discover that you were a Pagan? Selena Fox – Ever since I was a very young child I have had a strong affinity with Nature. I found that being outdoors in natural settings was one of my favorite things to do. Throughout my life, I have enjoyed listening to the sounds of birds and sitting meditatively by trees. Plants, creatures, and the Elements of Nature are my friends. I have had special close relationships with the companion cats in my life. Although I did not call myself a Pagan when I was a child, now as an adult, I realize that I already had Pagan leanings. Special bonds were formed and developed between me and animals, places, and plants, with the wind, with land, sacred fire, the sun, waters. I found that my own inner Pagan spirit began emerging very early in life, in that I had what would best be called “mystical experiences” while I was communing with Nature. During these times, I found myself going beyond the confines of my human-centric consciousness and feeling a oneness with the Divine. I not only experienced the Divine within me but within the greater Circle of Life. I was raised in a fundamentalist Southern Baptist family. Although some of my mystical experiences occurred indoors in a Christian church setting, most emerged spontaneously when I was doing my own type of Nature communion outside. I found that I was most comfortable with spiritual activity outdoors and being in places where I was one with the unity of Creation and Creator. Religioscope – But this was a kind of solitary Pagan awareness. When did you come in touch with other Pagans? When did Pagan community life begin for you? Selena Fox – I began having group experiences when I was twenty-one years old and a senior in college. I went to the College of William and Mary in Williamsburg, Virginia, U.S.A. My undergraduate studies were in psychology but, in addition to my major field, I continued my love and study of the Classics, which had begun when I was thirteen years old and in ninth grade, eight years before. During my senior year in college, I was the president of the Classics honors society, Eta Sigma Phi, as well as the president of the Classics Club, which was open to everyone regardless of their academic achievement. I decided, as president of both organizations, we needed to enhance our learning about the Classics in an experiential way. The Classics department was one of the oldest departments on campus, and dated back nearly three hundred years, with the founding of the college in 1693. So there already was a long tradition of Classics at my college. I got the Classics professors to agree to be part of a re-creation of a Rite of Spring where we drew on both ancient Greek as well as Roman traditions. We picked a beautiful Springtime day to have this learning experience, which was a re-creation of an honoring of the Divine as Great Father in the form of Dionysus, God of Rebirth and Ecstasy among the ancient Greeks, and of the Divine Feminine, Mother Earth, known as Terra to the Romans and Gaia to the Greeks. I was the priestess of this ritual. I carried with me a tambourine and a pine cone-tipped staff known as the thyrsus, traditionally part of the rites of Dionysus. We dressed in long, flowing, toga-like outfits with ivy in our hair, and we went processing through campus making joyful sounds. Someone played the flute and I played the tambourine. We got to a beautiful place on campus, the Sunken Garden, dating back to the colonial era and designed by Thomas Jefferson who went to school there. In the middle of this beautiful garden area, we perfomed our ritual. We called on Dionysus. “Io! Evohe! Io! Evohe! Io! Evohe!” We then began dancing ecstatically and in so doing connected with ancient Greek Dionysian traditions. We peaked our ecstatic dance, and then laid down on the ground and honored Mother Earth. This group ritual experience was both fun and educational. But for me, something additional happened within myself – it was spiritually transformative. I realized that I had come home to my religion. I realized that I needed to do rituals such as this as part of my life. I did not know fully at that time I would actually be a full-time Pagan priestess as my career. But I realized how therapeutic and transformative this Pagan ritual was. Now in retrospect, I realize that the gateways of my spiritual perception were thrown open by performing that ritual and invoking with ancient Divine forces. I aligned with ancient Pagan roots and from that point onward I was forever changed. Within two months of doing that ritual, I encountered a small group of women who were practicing a form of the Pagan religion rooted in the folk traditions of old Europe in a place once known as Prussia. A woman named Marianne was a hereditary Pagan. Pagan folkways had been passed down from generation to generation in her family. It was an oral tradition and there was no book. There was not a lot of elaborate liturgy involved and this path was very simple in some of its practices. It was basically a continuation of folkways with a spiritual dimension to it. Marianne’s Paganism was a women’s tradition, passed on to her from her grandmother. What we shared together consisted of going out under the Full Moon, invoking the Moon Goddess and celebrating our connection with all of Nature and making magic. I began by working just with her, and then that Summer, several other women joined us. So my first experiences with Paganism in community settings was these experiences with Marianne as well as the ritual I led as an educational experience. As I continued to go deeper in my explorations, actually the old Gods and Goddesses, the Old Ways, found me, and I began increasingly practicing Paganism with others. How did I find Marianne? Although I majored in psychology and was an honors graduate, the first job I got was working on an archaeological dig. Throughout my life, I have had a long-time interest in ancient cultures, in preserving history, and in researching history. I talked my way into an archaeological job even though I had no academic training in archaeology. I was able to restore pottery and do displays as I did have some art training. And, I actually went out on the archaeological digs on some occasions. Marianne worked on this dig and we both worked in the laboratory cataloging broken wine bottles, windowpane glass, broken pipe stems and other artifacts from a dump of a colonial tavern. We discovered our common interest in honoring the sacred dimensions of Nature. In addition, I realized that she shared my own positive associations with the “Witch” word. She invited me to practice Witchcraft with her. That was in the Summer of 1971. Religioscope – I see two elements here. On one hand, it was still in the atmosphere of the counter-culture of the 1960s. On the other hand, there is the feminine dimension, a group of women, the feminine dimension of the Divine. So, would these be two major impulses stand behind the rebirth of Paganism? Selena Fox – Yes. And, in my own case, I also think my connection with the Classics, which is coming from a much more conservative form of tradition. For me personally, my immersion in the Classics is what brought me to Paganism. The Neo-Classicism of the America colonial era is part of my conservative, political upbringing, roots, and training. I am the descendant of ancestors that came to America from England, Switzerland, Scotland, Ireland, Wales, Germany and other parts of Europe in the sixteen and seventeen hundreds in order to practice their forms of religion. I view my embracing of contemporary Paganism as also part of my ancestral tradition of what I prefer to call religious innovation, but which was regarded as religious radicalism by those persecuting my ancestors. ican and descended from the Cherokee people. Some of my own understanding of Nature religions also comes from teachings of my Native American ancestors that have come through childhood dreams, and from my own personal practices of working at sacred sites. As an adult, I have encountered elders from a number of different native traditions that paralleled Nature traditions rooted in old Europe. I have come to know that my spiritual path in this life involves honoring and working with the sacred dimensions of Nature in multicultural ways. I see Nature religions as having roots in the oldest parts of humankind and yet what I practice now is not something that was practiced in an unbroken line by Pagan peoples thirty-five thousand years ago or even two thousand years ago. The Paganism I practice is something that draws on the roots of the ancient past from many cultures but also draws on the here and now in a time where there is multiculturalism and a time where we have post-modern philosophy. Paganism today has evolved in a time where there is an environmental crisis and a need for there to be environmentally relevant and responsible forms of religion. Religioscope – As you were practicing at the time with Marianne, were you aware there were other Pagans in the United States, groups of different traditions or did that become an awareness at a later stage? Selena Fox -My awareness of other Pagan paths across the country came later. When I was a child, my rituals were quite private. When I was a young adult, I was part of the youth culture of social reform. Although not called “Paganism,” I took part in the Pagan-like celebratory experiences that were part of the 1960s youth culture — drumming, dancing, being outside, sharing of loving consciousness, communing with Nature, working for a better environment. I realized there that being with others in those times fed my soul. I realized I was in that emerging community that was known as youth culture that wanted something different in society, something that focused on harmony, multiculturalism, inner religious peacemaking, equal rights for humans whatever their color of skin, their gender, their sexual orientation, their national origin, their socio-economic class. I was a student leader of the social reform movements in the 1960s in America, and one of the few women who was in a leadership role. In the 1960s, I marched for civil rights in America and I worked on peace making with Quakers, with Roman Catholics and people from other religions, and I stood in peace vigils. I helped organize the very first Earth Day in 1970. I also worked for the Pentagon in the 1960s but did not find a conflict working for the Office of the Chief of Staff of the US Army and serving my country as a civil servant during the Summer. My Summer jobs were all with the U.S. government. I did not find that a conflict with my social reform work, because I have come from a long line of ancestors and family members in government service, both on my mother’s side and on my father’s side. I have a strong commitment to serve not only to my country but the international community of nations. As part of my organizing social reform demonstrations and other actions, I felt it was important to abide by rules, and to have these actions orderly, peaceful forms of exercising free speech. I would have nothing to do with any of the violence as a form of social dissent, and would have nothing to do with any of the voices that said “Get rid of government” or “Get rid of this government”. To me, government plays an important role in society and I wanted to continue to work within existing structures in making changes. And today I continue to work with the government in providing Pagan religious accommodation information in order that Pagan people are treated equally and fairly along with those of other religions and philosophies. I know this has been a long response to your question. I didn’t realize that there were truly other people calling themselves Witches, Druids and Pagans until I encountered Marianne and then later when I was in graduate school at Rutgers University in New Jersey, began meeting other Pagans as well. Selena Fox – Paganism in America was a mix. There were some spontaneous dimensions to the emergence of American forms of Paganism and Witchcraft. Gardenian Wiccan influence was present, but not the only force. I respect the perspectives of my academic colleagues who have documented the contributions of Gerald Gardner (1884-1964) of England to contemporary Paganism. I acknowledge that Gardner did much in terms of putting together rituals, publicizing the existence of this new form of Paganism, which drew on some old traditions as well. According to Gardnerian tradition it is also part old. But I did not come to Paganism through Gerald Gardner. I did not even know who Gerald Gardner was until I had already been a priestess for a number of years. The stories of Pagans who have come to Paganism by other routes is yet to be told in academia. For more than twenty-five years, I have been talking with practitioners and elders in a number of Pagan traditions that are usually termed family traditions. There has been quite a bit of secrecy around these family traditions. As a scholar as well as a priestess and practitioner, I must say I find it difficult academically to be able to verify all of the information that I have been gathering from family tradition practioners over the years. Accounts have been such as the teachings I’ve received from Marianne who had this come to her through her family. There were no written records whatsoever. I did not meet her grandmother. So I had to take the teachings that were passed on to me by her and those reports from others at pretty much face value. I think that has been one of the problems in the academic exploration of the growth of Paganism in general and Witchcraft/Wicca in particular. There is much emphasis on Gardner in the written literature. There has not been much inclusion of some of this other material and, because it’s not visible, some scholars have come to the conclusion that Gerald Gardner has madeWicca up, or at least most of it. I do not think that is correct, based on the research that I have done thus far. ons alive but under a Christian veneer, being called St. John’s day, St. John’s night. Different parts of Europe, I have discovered, may celebrate the start of Summer on June 23rd or 24th or 25th. Some of the Pagans I have encountered, especially from the Baltic areas of Europe, are now reclaiming Summer Solstice day and night, and like us, celebrate not just on one night but multiple nights. So certainly his influence on Circle has been significant because we have kept alive not only some customs he had in his village as he grew up but we’ve added to it. I think that contemporary Paganism has been influenced by the counter-culture’s worldviews of celebrating and enjoying life, communing with Nature, exploring consciousness and life’s mysteries. That has been one significant influence. The idea of having a form of spirituality where male and female dimensions of the Divine are in balance, which you might call feminist or some may call gender equity, is another important influence. The environmental preservation relevance is another very important influence. Many people come to Paganism because they are hungry for a religion, a spiritual home, that encourages them to pray and practice their religion outdoors, allows them to honor the Divine not just as some transcendent being but something that immanent, that is within us, that connects us with the greater Circle of Life, also known the web of life or as the sacred hoop as some native people call it. In addition to those three influences, the Western Hermetic tradition has been a very powerful influence. Some symbols, myths, and teachings from the ancient Egyptian mysteries and from the Jewish and Christian studies of the Cabbala in the Middle Ages are part of the Western Hermetic tradition. The first time I was priestess of an on-going spiritual group was a lodge called Spectrum, which was an interreligious ceremonial magical lodge in the Western Hermetic tradition. The founder of the group had been studying alchemy, ceremonial magic, Golden Dawn liturgy, Egyptian religion, Buddhism and Christian mysticism for many years. I came to this group as a result of intuitive guidance which occurred in meditation one day. After I left graduate school in New Jersey, I had moved to Madison, Wisconsin. The message that came to me in meditation was to go down on the street and walk along and I was going to see a sign. Well, when I get something that specific, my scientific side encouraged me to “Check it out.” I was living in an apartment in the center of the city. I was studying commercial art at that stage in my life and I was still a very young woman, in my 20s. When I went down to the street following my meditative message, I literally saw a sign on a lamppost that announced a psychic fair for the next day. I realized I needed to meet people there. I decided I was going to go to that event in order to meet those people. Unbeknownst to me then, a group had been working with a ouija board doing spirit communication and had a message come through that said the group would deepen when the priestess would show up and that their priestess was coming. The next day I went in to this conference organized by an interreligious esoteric spiritual group. And I saw the people I sensed I was guided to meet. They were two brothers. The older brother was the main organizer of the event and the group that sponsored it, and the younger brother was the trance medium. When I saw them, I knew those were the people I needed to meet. But they didn’t recognize me as their priestess at that point. At the end of the day¸ I went up to them and talked with them and asked them about an opportunity for further study and they invited me to their study group. I went to their study group and that’s when both they and I realized I was the person that was completing their circle. I became the priestess of the group and assisted the high priest of the group. We honored the divine in many forms but our central form was the goddess Bast from the Egyptian tradition. I see that the Western Hermetic tradition not only helped my own growth in Paganism but it has been an important influence for many Pagans. And there are some other influences that I could talk about but I would say those are the major ones. Religioscope – When you founded Circle, the first title of the magazine published by Circle was”Circle Network News”. 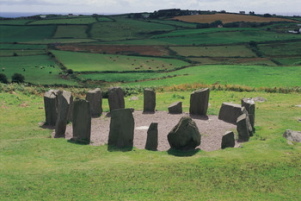 Behind the idea of Circle was the idea of connecting, networking among Pagans. Could you please tell a little bit more about that work of networking among people who were often solitary practitioners or small groups splitting away from other groups? What happened in terms of networking in the Pagan world in the U.S.? Selena Fox – In 1974, just before Samhain, our spiritual new year, and around the time of my birthday (I was born October 20), I had the name “Circle” come to me as well as the logo of twelve circles around a central circle. I also had the sense that it was important as part of my life’s journey to create an organization that would bring people together, to support each other in the study of Nature religion and esoteric philosophy. Although we began small, Circle was international at its start. The very first Circle gathering we had was an informal gathering held at my apartment in the south part of Madison. A woman from England and a man from Scotland joined some of us from the United States. It was Winter Solstice time. I had the name come to me at Samhain and at Yule we were already international with Europe and the United States linking together. We continued to meet informally, and some of us presented talks and started having activities on a local level at that time. Even though there was an international influence, we were pretty much for the first year or so working within Wisconsin. I was invited to speak at Gnosticon, which was sponsored by Carl Weschcke and his Llewellyn Publications. In 1976, I was a singer and a presenter at that conference and realized there was a need, because that was a national conference, to do more work with networking. Following that conference in 1977, I founded Circle Network and began publishing Circle Network News as a one sheet, occasional newsletter that would be a service that would start linking people together. My partner at the time was Jim Alan, the trance medium brother from Spectrum. Spectrum dissolved as its members moved on into different groups and projects. I founded Circle and Jim Alan assisted me. Primarily he was a musician, and I assisted him in the music making. We released a cassette tape and a songbook of our music and word began to spread among Pagans about our efforts. Pagans were not only ordering our book and our tape, but they wanted to be connected with others in our area. Becauses of these needs, as well as my experience with Gnosticon, I decided we needed to facilitate a network. And before I knew it, Circle Network had grown to five thousand Pagans, not only in America but around the world. Part of the international growth came from our US service people who were serving around the world and who took our publications as well as news of our networking endeavors all over the world with them. Quickly, Circle became very international with members in Australia, Africa, Japan, South America. Circle Network grew primarily in the English speaking parts of the world because all of our literature was in English. At one point, we even had Circle publications in Antarctica at the research station because there was a Pagan there. We also even had a Pagan in Pago Pago on Tutuila Island of American Samoa in Polynesia. Over the years, we have had connections with Pagans on every continent on the planet. Circle will be celebrating its thirtieth anniversary this October. Over the years, I have seen Paganism grow from being very decentralized and even with a bit of anti-institutionalism early on which was part of that counter-cultural trappings — to a world religion with institutions, with sacred land, with participation in interreligious, international and local gatherings. I also have seen equal rights for Pagans and Pagan religion emerging not only in the United States but other parts of the world Paganism is continuing to grow in numbers and diversity. It is increasingly getting respect and being acknowledged as being the world religion it is. Of course, part of how I’ve seen that growth is that I have been part of that effort, and it is part of my vision to help bring back the Nature religions on the planet and to bring them back in a form that brings about peace, harmony, not only amongst the various Pagan paths, but also among practitioners of other philosophies and religions and most importantly with the greater Circle of Life on planet earth and the larger universe. Part of my work as a priestess is to work for equal rights, to work for peace and harmony in the larger interreligious realm and, in a small way, to help humankind be back in better relation with the greater wheel of life that we are all a part of. Religioscope – How far do people from non-western European traditions involve themselves in the networking around Circle? Is it primarily for people of western descent or do you also have African Pagans, Native American Pagans, taking part actively? Selena Fox – Circle has ethnic, cultural, and racial diversity in our community. Circle has sacred land, Circle Sanctuary Nature Preserve, in Wisconsin in North Central USA. The Circle Sanctuary Community is the group of people that takes part in various spiritual events there. We also have Circle Network, which is the much larger network of Pagans we serve and that network is international. 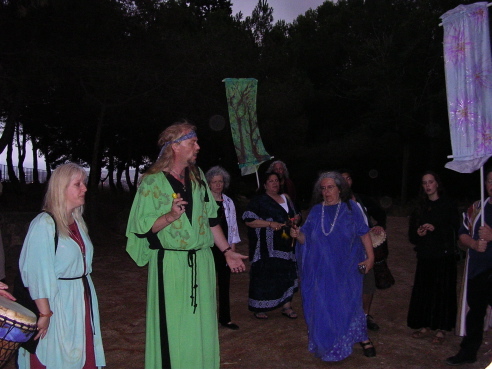 The annual meeting of Circle Network is at the Pagan Spirit Gathering, held during Summer Solstice week, every year. Circle Network is throughout the world, the Americas, in the Pacific, Asia, Europe, Africa. We have Pagans from many countries and cultures on Circle Network. And I think part of the reason we’re so multicultural and international has been due to the scope of contemporary Paganism and due to the muliticultural background of many of us, including me, who are closely involved in Circle’s work. Since Circle’s beginnings, we started having contact from people from other countries and from other traditions. 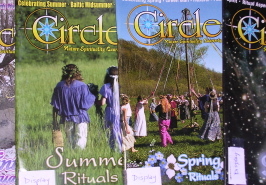 Circle Sanctuary has a Circle Craft Wiccan foundation, but serves many Pagans. Circle Craft, which is an inclusive form of Wiccan spirituality that I founded brings together old traditions and new ways. Circle Network includes Pagans of many, many paths. So not only do we network with Druids, Teutonic Pagans, the Baltic Pagan religions, various forms of Celtic traditional religions but we have people recreating the Middle Eastern traditions, the Egyptian traditions, Roman and Greek traditions and there are Pagans who are from other cultures in traditional ways that are mixed ancestry that have found their way into Circle Network because there they can practice their traditional religious ways, or their indigenous ways, but also be part of the larger Pagan scene. In our priesthood, we have a Mexican-American Pagan who is of mixed Mexica and Spanish heritage. We also have a Native American Santee priestess who lives on the Lac-du -Flambeau reservation and she has married into Ashanabi (Ojibwa) people. She also has some European ancestry. Early on, we started networking with people in Africa, and in Asia, in Latin America. So right here at the Parliament she found the name to put on the spiritual path she already was walking. And for me, I was already on a Pagan path before I realized that it was called Pagan. Although there certainly have been some conversion experiences in which Pagans shift from their religion of origin to Paganism, what is more often the case is that a person already is aligned with Paganism and learns to apply that label to it. Religioscope – When you look in retrospect at what has happened over the last thirty years, what strikes you most in the Pagan scene as you observe it? Is it, for example, the explosion of the different ways in Paganism? This is of course striking . It seems you even have Quaker Pagans, Sufi Pagans, all kinds of unexpected mix of Paganism. What is most striking? Selena Fox – I believe that Pagan culture in the world today is becoming increasingly interconnected, intra-traditional and international. This Parliament has been part of that process. The previous Parliaments have been part of that process. The Pagan Festival Movement that I was part of in the 1980s has been part of that process. I helped birth a number of Pagan festivals, not only the Pagan Spirit Gathering, the ones we do at Circle, but others started by leaders from other traditions coming to the festivals we sponsored back in the 1970s and 1980s who decided to create their own festivals. A new part of Paganism today is not just the idea of intratraditional festivals but the idea of creating intentional community that is multicultural and international. When we look at the ancient times, there were different Pagan civilizations and different Pagan religions and they weren’t always in harmony with each other. The Romans conquered the Celts, and the Celts and the Teutons were battling it out with each other in ancient times. I know from studying my own ancestral history, which includes having Roman, Celtic, and Teutonic in my background, and my own Pagan practice incorporates some symbology and traditions from them. Although there are still some rivalries and some conflict amongst the various Pagan traditions and groups, I have really seen increasingly a willingness to cooperate, to collaborate, to communicate, to share information. There’s a body of Pagan chants now that’s going around the world. Some of the chants now have variations of them and they’re being sung in different languages. Some other important things about Paganism I have noticed has been creativity in Ritual forms, such as the web we wove in the ceremony last night where the spirit has been brought forth. Webweaving in rituals has gone among many Pagans around the world. Other groups have been doing it. The idea of creating sacred sites also has been growing in Paganism. We are not only honoring and protecting the old sacred sites, we are creating new ones and obviously with Circle Sanctuary being land based, we have been some of the pioneers in that trend and the idea of Pagan institutions. Certainly there are still some Pagans who are uncomfortable with the idea of institutions because of some problems with their religions of origin and/or repression that can come from institutions. But I’ve been a strong advocate that we do not get rid of institutions, but to develop responsive ones. You look at tribal society. They are structured. They’ve got their own kinds of institutions. We look at Nature. We look at different types of species of animals. They have structure. There may be hierarchy. Hierarchy in itself is not wrong. Or it might be more consensus collective. You find a variety of social structure forms among creatures in Nature. You find that amongst humankind and you find it in Paganism today. I think one of the most exciting trends is that Pagans from around the world are coming together and are identifying ourselves as part of a global Pagan culture. We are a global people and we’re meeting each other. We’re sharing rituals together. And at this Parliament, we are making history because out of all the international conferences that I’m aware of, where Pagans have come together both in the intrareligious as well as the interreligious realm, I believe we have had more continents represented here at this Parliament than at any of the other gatherings. Although I have not talked to every organizer of every Pagan gathering with an international component, it has been my experience over the last ten years there has been a growth in national gatherings as well as intercontinental gatherings. Here in Barcelona we are finding Pagans coming together not only to celebrate with the world religions community here but to celebrate with each other. And part of the reason Circle Sanctuary and some of the others sponsored the Welcome Pagans at the Parliament reception here was to build community internationally and across traditions. To help us be interconnected not only here at this Parliament but as we go out to our homes when this Parliament is over, we now have friends in many places and we can work together. We’ve been multilingual here, we’ve had rituals translated in different languages. Last night, I guided people in chanting in peace from the different traditions. We need to have more of this, of Pagans working together for world peace, for a healthier environment, and for religious freedom of our people. Gerald Gardner (1884-1964). Claimed to be an English hereditary witch and played a key role in reviving Witchcraft in the modern world. He published Witchcraft Today in 1954 and The Meaning of Witchcraft in 1959. Gardner wrote ritual material (partly in collaboration with Doreen Valiente, 1922-1999). A number of witches continue to follow the Gardnerian tradition.